I love to talk about health on the blog in all forms. 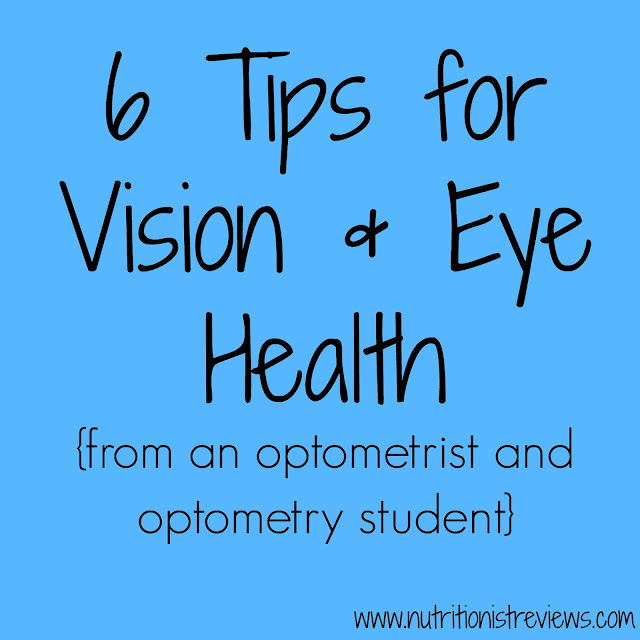 Nutrition, fitness, mental well-being, getting enough sleep, oral health and now- eye health. I personally am not the person to share eye advice so I am turning to the experts. My dad is an optometrist (AKA eye doctor) and my brother is in his third year of optometry school. My dad has been an optometrist for over 25 years and won optometrist of the year the first year that the award was given several years ago, so he knows what he's talking about (little brag from a proud daughter)! Along with some insight from my dad and brother, I have some tips from the American Optometric Association on contact lens wear and care. 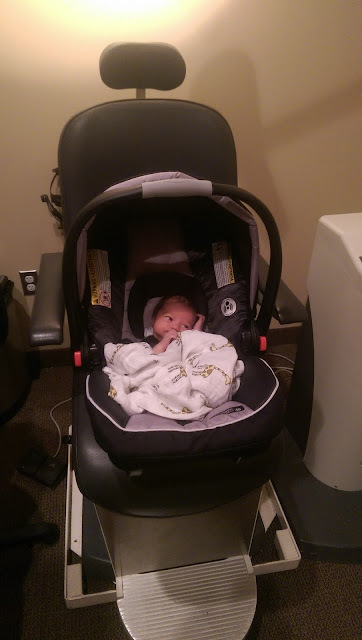 Adalyn getting her first eye exam at 5 days old- okay fine, we were really there for a pizza party! 1. Get a routine yearly eye exam- My dad says even if you are not having issues, you should get a yearly eye exam to rule out that there are not more serious issues going on. For example, glaucoma has no symptoms but can be detected in an eye exam. 2. If you wear contacts, follow the instructions on the package- Some contacts need to be taken out regularly and some do not. Do not keep them in like my husband used to if they are not supposed to! According to a recent AOA survey, 59% of Americans wear contact lenses longer than recommended. This can cause eye damage from bacterial infections and oxygen deprivation. My brother says to change the solution everytime you take your lenses out- otherwise, it is like doing your dishes with the same dirty water the next day- yuck! 3. Diabetics especially require a yearly eye exam- Diabetics can have diseases of the retina and early detection in an eye exam can be beneficial. 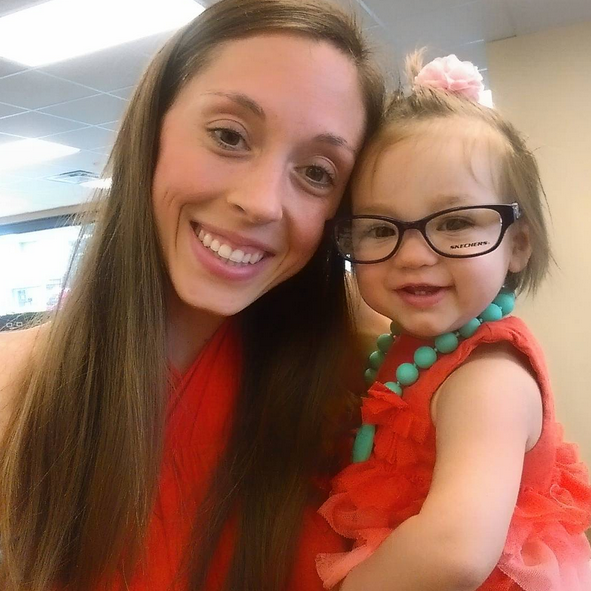 Adalyn says, I support eye health and glasses. 4. Keep up a healthy lifestyle- Just like with any other health issue diet and exercise plays a huge factor. This tip is from me: lots of produce, whole-grains and lean protein is the way to go. 5. Certain glasses are needed for different tasks- There are reading glasses, driving glasses, safety glasses, computer glasses, sports glasses, etc. The optometrist can help you with what you need. By having the kind of glasses that you need, you will be able to perform at the highest level possible. 6. Contact lenses are one of the safest ways for vision correction, if worn properly- Children may start wearing contacts around the age of 10-12. They should have annual eye exams to stay up to date with their needs. Safe handling of contacts is very important. When people do not use contacts as directed by an eye doctor, the consequences can be dangerous and damaging to the eyes. Clean and rinse lenses with proper solutions to remove anything that is not supposed to be on lenses to avoid bacterial growth. Decorative or non-corrective contact lenses that are illegally sold can be dangerous and should be avoided. Adalyn trying on some glasses. I think she looks pretty cute! For more information on healthy contact lens habits, check out this from the AOA. They have 39,000 optometrists, optometry students and more. They provide 2/3 of all primary eye care in the US. They provide nearly 70% of first time eye exams for Americans. Eye doctors perform eye exams, diagnose and treat eye disease and recognize symptoms like systemic diseases like diabetes and high blood pressure (my dad does this all the time and alerts people to go their doctor immediately when their blood pressure is very high). As you can tell, I love my eye doctor ; ).